Won-Young Kim, a seismologist at Columbia University’s Lamont-Doherty Earth Observatory, said a station relatively close to the site showed the blast produced waves equivalent to a magnitude 5.1 earthquake--roughly translating to a yield of 7.3 kilotons. By contrast, an earlier study by Kim and colleagues estimated that North Korea’s initial test, in 2006, yielded a relative fizzle of less than a kiloton; this was followed by a 2009 blast that produced about 2.2 kilotons. (A kiloton equals the explosive energy of 1,000 tons of TNT). The estimate of the latest test is in line with a statement from the South Korean Defense Ministry this morning saying the blast measured 6 to 7 kilotons. Also this morning, U.S. director of national intelligence James R. Clapper Jr. said the yield was “several” kilotons, demonstrating an advance toward making a substantial weapon. “The first test almost failed. The second one showed they could basically do it. The third one showed that this is really working,” said Kim. The blast was small on the scale of modern weapons; the bombs that leveled Hiroshima and Nagasaki in 1945 yielded 15 to 20 kilotons, and bombs stocked by nuclear powers today run into hundreds of kilotons. Nevertheless, “every one of these explosions is dangerous, even the first one—these would really be an antisocial thing to drop on a modern city,” said Lamont seismologist Paul Richards, an expert in the detection of nuclear tests. This week’s test shows that the North Koreans “are absolutely learning the practical details of how to put material together, press the button, and get more out of it each time,” he said. The explosion went off shortly before noon on Feb. 12, Pyongyang time—9:58 pm Monday, Feb. 11, U.S. eastern time. Seismic waves received by multiple stations were traced to a facility about 20 miles from the city of Kilju—site of the two earlier tests. Kim analyzed signals picked up by a station in Mudanjiang, China—at 205 miles north, the closest from which signals are available to nonmilitary researchers in real time. These clearly showed the fingerprints of nuclear blast—several sudden, sharp jolts, followed by a prolonged buzzing of the earth. The “signals this time were very similar to the previous ones,” said Kim. In contrast, natural earthquakes start off with a slower rumble and grow bigger. Using the scale that gauges earthquakes, the event as measured by the U.S. Geological Survey was a magnitude 5.1—if it were an earthquake, enough to do moderate to severe damage if it shook right under a city. Using a standard formula based on the known geology of the area (mostly dense igneous and metamorphic rocks) and other factors, Kim converted the magnitude of the shaking into an explosive force of 7.3 kilotons. Built-in uncertainties in such calculations mean other stations may have measured a yield as high as 11.7 kilotons or as low as 4.6, he said. However, a check of signals from more distant stations in China and Japan are consistent with the measurements from Mudanjiang, he said. The 7.3 number is conservative, in that it assumes the explosion was “fully coupled”—that is, closely confined by surrounding rock so that seismic waves would be broadcast efficiently through the earth. If the North Koreans hollowed out a cavity large enough to absorb some of the force and thus muffle some of the explosion’s signs, the blast could conceivably be much larger, he said. But Richards and others say the immensity of engineering such an excavation make this unlikely. Hundreds of seismic stations picked up the blast. Kim and Richards said it could take months or years for experts to analyze more data and come up with a more exact number on the bomb’s yield; but, they said, the overall multiplying trend with each new test is clear. Richards said that in coming days, the release of radioisotopes may allow experts to determine whether the blast was produced from plutonium as in the past, or from more easily obtained enriched uranium—a potential development that governments around the world have been watching closely. The test came at a particularly delicate time, with the leadership of South Korea about to shift, and U.S. president Barack Obama scheduled to speak tonight about new efforts to limit nuclear weapons during his State of the Union address. 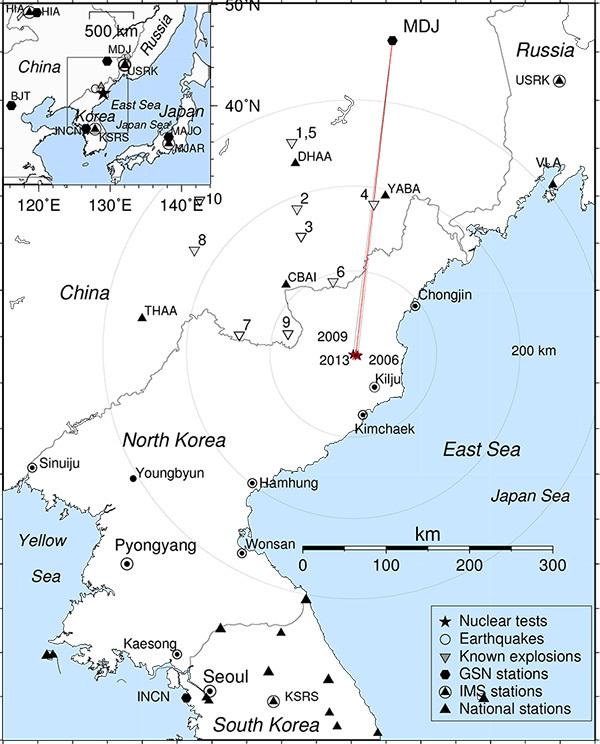 Richards, Kim and their colleagues have been leaders in showing that even small nuclear explosions can reliably be detected using seismic waves; these included the first North Korean test. Earlier this year, they debunked the suggestion that North Korea had carried out a 2010 test, based on the lack of seismic evidence.